The Big E or No. 88. That’s Eric Lindros. He was a tower of power. Unfortunately his career was hampered by a series of concussions. Yet his dominance didn’t go unnoticed proof of which was his induction into the Hockey Hall of Fame in 2016. He officially retired on November 8, 2007 at the age of 34. His NHL career spanned 13 seasons with the Flyers, Rangers, Maple Leafs and Stars. Balking at being drafted by the Quebec Nordiques first overall in 1991, Lindros spent a year with Canada’s National Team and won Silver at the 1992 Olympics. His rights were eventually traded to the Flyers and Rangers on June 20, 1992. A week later, an arbitrator ruled in favour of the Flyers who shipped six players (including Peter Forsberg), two draft picks and $15-million to the Nordiques. WOW! Lindros instantly established himself as a star in the NHL, spearheading The Legion of Doom (with Mikael Renberg and John LeClair). Over eight seasons with the Flyers from 1992 to 2000 he produced 659 points (290 goals) in 486 regular-season games plus 56 points in 50 playoff appearances, including a trip to the Stanley Cup Final in 1997. In 1994-95 when he became Flyers’ captain, he earned the Hart Trophy as NHL MVP. For his NHL career, Lindros played 760 regular-season games and finished with 865 points (372 goals). He added 57 points in 53 playoff games. 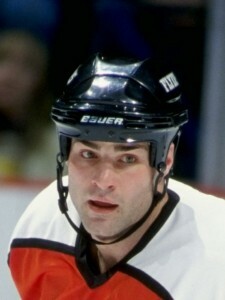 Lindros twice won Gold with Canada at the World Junior Championship, Gold at the Canada Cup in 1991 and added Gold at the 2002 Olympics to go along with his Silver in 1992. Despite his setbacks, Eric Lindros emerged as one of the game’s best-ever players.